Ella Funt is all done and I am very happy with how it turned out. See how nicely the yoke lays without puckering? 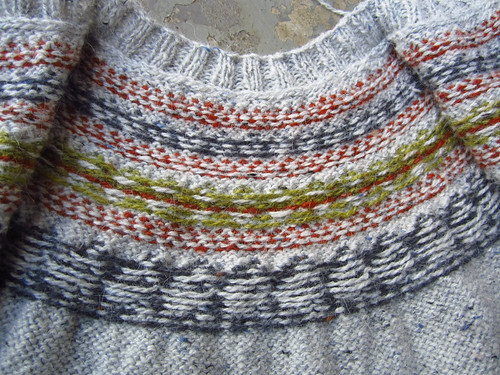 I think it was partly that the Rowan Felted Tweed was a good choice for this type of knitting. 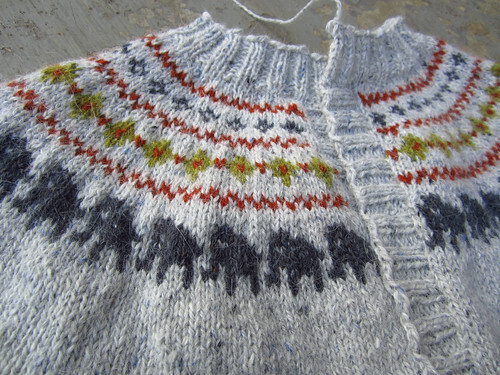 It has that slightly sticky quality that jumper weight Shetland wool yarn has; at least it seems so to me. This is how it looks after weaving in the ends and washing/blocking it. Here’s how it looked before all that was done. Still pretty good, but the finish work really made an improvement. Here’s a view of the wrong side to see the lovely neat floats. The color is truer in these three middle pictures that were taken outside before the finishing was done when the light was good. Unfortunately today was rainy and gray all day and I couldn’t wait to share this so I took some indoor shots this afternoon. 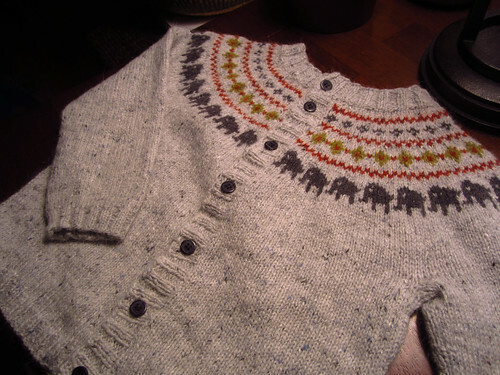 I will get some proper lighting pictures outdoors with Elijah wearing it as soon as we get another sunny day. I did make a few modifications to the pattern. 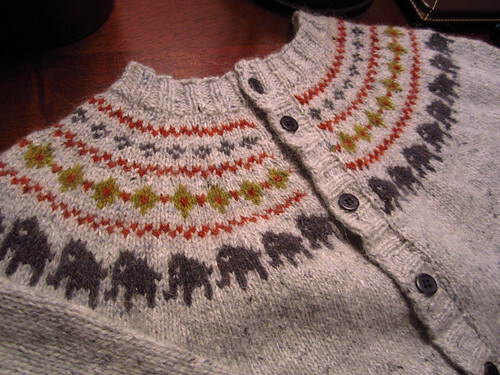 I bound off the neck stitches and picked up the button band stitches first, then picked up the collar stitches after the button bands were knit. I substituted a ribbed stitch for the button band to match the other edges instead of the garter stitch the designer chose. 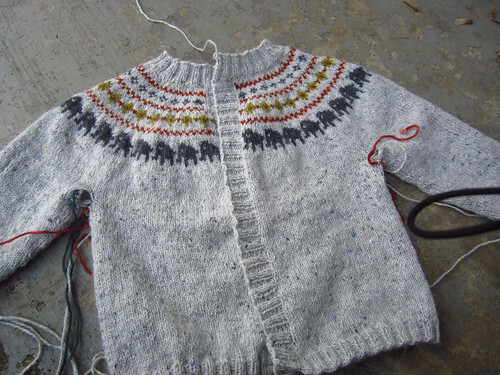 If I had thought of it at the time I would have also added some short row shaping to the back neck before I bound it off, but I forgot at the time. So if I were to make this again that is what I would do next time. In other news, did you notice my new banner up there at the top? Go ahead..scroll up. I’ll wait. You like? It’s just a simple one, but I like it. 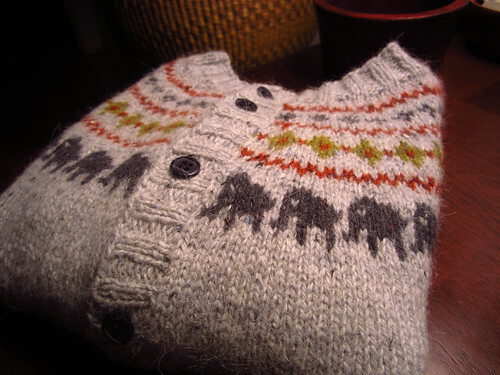 There is also a new widget over to the right where you can “like” my Knitting Notions page on Facebook. Hint. Hint. Heh. Let’s see, how about a reading update? I got the Masterpiece Theater version of The Woman in White from Netflix after I finished it last week and was not impressed. I didn’t even watch the whole thing. I was warned by a friend that it wasn’t as good as the book and I agree with her review. It departed from the story in too many points and it just annoyed the crap out of me. I did start a new book though which is very good. I had been hearing some chatter and good reviews about the book Child 44 and since I saw it available to check out from my library onto my Nook I decided to give it a go. I am finding the view from inside the mind of this KGB officer during Stalin’s Soviet Union very enlightening. I am about halfway done with it already. Okay, I need to close for now and get some supper. Later.